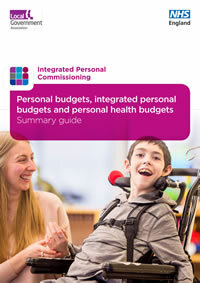 This summary guide provides a description of how personal budgets, integrated personal budgets and personal health budgets work, and sets out the key elements of personal budgets in the Integrated Personal Commissioning programme. Advice on pre-paid cards and e-marketplaces. Notional budget: the local authority or the NHS manages the budget and arranges care and support. Third party budget: an organisation independent of the person, the local authority and NHS commissioners manages the budget and is responsible for ensuring the right care is put in place, working in partnership with the person and their family to ensure the agreed outcomes can be achieved. Direct payment: the budget holder has the money in a bank account or an equivalent account, and takes responsibility for purchasing care and support. The statement of resources provides advice on how to develop the statement of resources and what money to include. This slideset provides examples to show how the statement of resources can be implemented in practice. This PDF version of the slideset provides examples to show how the statement of resources can be implemented in practice.